Judge Dredd exposed and thwarted an attempt by Interstellar Psionics Corporations to cheat a widow out of her lawful claim. Thugs from the company were using a Psi-chair to brainwash Widow Spock into signing away her newly acquired land. Following a tip off Dredd and his fellow Luna-1 Judges caught the criminals red handed. Dredd then ordered that the bosses at IPC be rounded up too. Interesting to see the Interstellar Psionics Corporations’ initials are IPC, the publishers of 2000AD at the time. Trouble at Mill? And beautiful Bolland artwork. In a tense and nail-biting finish when all seemed lost Judge-Marshal Dredd stepped into the breach to save us all. Out-classed by new Sov technology and down to two men a time-out was called. Finding our reserve man mysteriously incapacitated by a hypo-dart Dredd volunteered. Leading an unarmed charge against the Sov combat squad he seized their weapons and turned them against them prompting a surrender. Sov-Cities are now making preparations to hand over territory to Luna-1. A dramatic and action packed story and strong anti-war message. Arthur Goodworthy, number 31 accounts clerk at Moonie Enterprises on Lunar-1, becomes the first 22nd century Futsie at 7 seconds past midnight. Judge Dredd, informed by Goodworthy’s son, little Arthur Goodworthy junior, took charge of the case. Subdued during a rampage of property destruction Goodworthy is now receiving medical treatment. 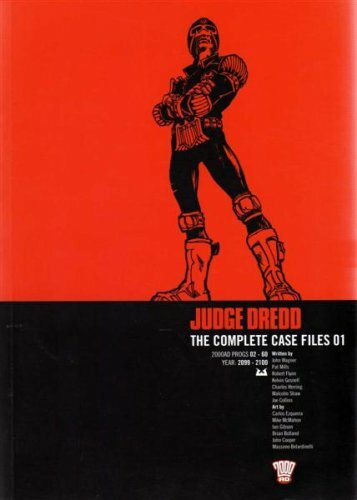 Dredd is following up on the cause of his condition with his employer C.W. Moonie, the great Luna explorer. For the second time this year Walter the Robot, domestic servant to Judge Dredd has been abducted by criminals. This time it was axe murderer Geek Gordon whom Dredd put away three years ago. Dredd staged a daring rescue piloting his hover-bike through a hotel window and surviving an axe blow to the neck. Gordon is now back in custody.